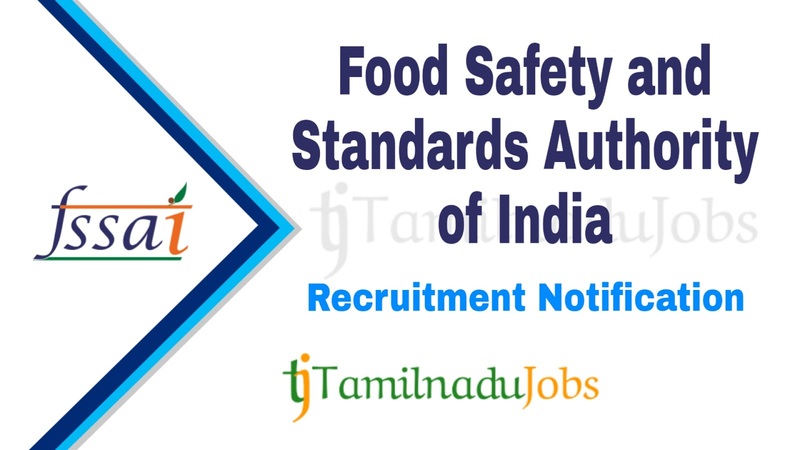 FSSAI Recruitment 2019: Good news for the Aspirants looking for Central Government jobs, now Food Safety and Standards Authority of India (FSSAI) published an official notification for 275 post to fill the Officers and Assistant, work in anywhere in India. Candidates must go through the official FSSAI recruitment notification thoroughly before apply for Officers and Assistant post. FSSAI Officers and Assistant job application is collected through Online mode only. In the recent Recruitment Notification, the following vacancy details given by the Food Safety and Standards Authority of India (FSSAI) and aspirants should go through the vacancy details and eligibility details for more detail in FSSAI notification link given below before applying. Aspirants meet the education qualification of Food Safety and Standards Authority of India (FSSAI) only apply for the Officers and Assistant job. FSSAI notification 2019, education qualification are given below. Degree of Law from a recognised University or institution with three years experience of handling legal matters or working experience as Law Officer in a reputed Government or Autonomous body or Research Institutions or Universities or Public Sector Undertakings or Law firms. Five Years relevant experience and Desirable is Graduate Aptitude Test Engineering or Council of Scientific and Industrial Research or Indian Council of Agricultural Research National Eligibility Test. Technical Officer “Master Degree from a recognized University or Institution in Chemistry or Biochemistry or Food Technology or Food Science & Technology or Food & Nutrition or Edible Oil Technology or Microbiology or Dairy Technology or Agricultural or horticultural Sciences or Industrial Microbiology or Toxicology or Public Health or Life Science or Biotechnology or Fruit & Vegetable Technology or Food Safety & Quality Assurance. Desirable is Graduate Aptitude Test Engineering or Council of Scientific and Industrial Research or Indian Council of Agricultural Research National Eligibility Test. any other equivalent or recognized qualification notified by the Central Government. Administrative Officer Bachelor’s Degree from a recognised University or Institution; and three years’ experience in handling administration, finance, human resource development or/ and vigilance and accounts matters. Desirable is Master degree or MBA ( Personnel or Human Resource Management or Finance) or CA or CS or ICWA from a recognized university or Institution. Assistant Bachelor’s Degree from a recognised University or Institution. Personal Assistant Bachelor’s Degree from a recognised University or Institution with proficiency in shorthand (80 WPM) and typing (40 WPM - English) and/ or (35 WPM Hindi) (ii) Should be computer literate and proficient in using MS Office and internet etc. Desirable is Diploma or certificate in office management and secretarial procedure or equivalent from a recognised or reputed institution. Assistant Manager (IT) B. Tech or M. Tech in Computer Science or any other relevant Engineering Discipline or MCA or Bachelor’s Degree in Relevant field with 5 Years of total experience and minimum 3 years experience in relevant field. Aspirants who want to apply for FSSAI Officers and Assistant 2019, must attain the following age limits given by Food Safety and Standards Authority of India (FSSAI). The application fees for Food Safety and Standards Authority of India (FSSAI) Officers and Assistant 2019 differ according to various categories. The application fees details for FSSAI Officers and Assistant given below. Food Safety and Standards Authority of India (FSSAI) is announced the recruitment for the Officers and Assistant to full fill their 275 posts. Aspirants have to pass the following selection process given by Food Safety and Standards Authority of India (FSSAI) to get Officers and Assistant job. For more detail and correct information check in the official notification of FSSAI. How to Apply FSSAI Officers and Assistant 2019? Step 3: Fill the details required by FSSAI in the form. Step 5: Before submitting the application for Officers and Assistant, check the details are correct, then press submit and pay the application fee.